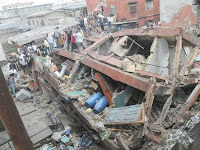 dejiolaluweblog: Opinion: Who should be held liable for incessant building collapse in Nigeria? 0 Opinion: Who should be held liable for incessant building collapse in Nigeria? Depending on size and complexity, the number of persons that can bring a building project to successful completion can vary from as few as one (sounds incredible but true) to as many as hundreds. To start with, you might want to ask, how can one person be responsible for bringing a building project to a successful completion? And Ill answer you straight up that it is very possible at least in Nigeria. If not, words like 'Daleko' or Dalemo which when translated means 'to build alone' wouldnt exist in the Yoruba communal lexicon. And Im so sure similar words exist in the communal lexicon of other Nigerian cultures too. Therere stories out there of landlords and surprisingly landladies too, though to a lesser degree, who singularly undertook their building project all in a desperate need to put a shelter over their heads. Except for people with background in bricklaying or masonry as it were, most of them did out of experiencing acute shortage of fund and rarely in a show of Do It Yourself (DIY) stunt. Further credence is lent to this spin because we have communities whose names were derived from such endeavors. In Lagos and Ogun states, there're Daleko and Dalemo communities respectively. Isnt that interesting? Even if it's suicidal, it is in the nature of man to at the slightest push resort to cost effective self-help in the absence of accessible alternatives though not mindful of the academic fact that shelter is somewhere up there in the Maslowan hierarchy of needs. However, it still makes existential sense to all and sundry. Dont blame them alone. The bulk of the blame instead should go to the regulatory authorities who did nothing to ensure these daringly inventive people adhere strictly to relevant housing laws. Multiplying incidents of collapse building and who should be held responsible? These definitely are not the best of times in the housing sub-sector of the Nigerian economy with the recent multiple reports of collapsed buildings in different parts of the country. It is always painful because precious lives were continually being lost. The government in its usual characteristics has responded by setting up a special committee to look into these tragic developments with view to identifying the causes and proffering measures to prevent their re-occurrence. The approach sounds too familiar; and the language de-constructively bureaucratic and lame. While the step taken by government maybe commended if not something out of the extraordinary, it must, however, be stated that government can do more indeed in terms of proffering lasting solution to the ugly trend by way of criminalizing key and culpable stakeholders who have close connections to any collapsed building to ensure total compliance to due diligence in the discharge of their duties going forward. This should include regulatory agencies too. There must be dire consequences for personnel in the concerned agencies whose official activities must always come in form of 'stitches in time which save nine' and not a routinely annoying medicine after death post mortem to be carried out after every building collapse with the attendant irrecoverable loss of human lives and material resources. It has become very important because the collapsing buildings are not just the old ones. Even buildings under construction as well as their more recent counterparts have also caved in over time raising concern over likely breaches of standard building procedures by structural engineers. From what we know, this is an open secret. Quality of building materials like iron rods, cement, concrete blocks/slabs used and the ratio of their combinations are in many cases suspect. Building professionals are known to deliberately compromise engineering standards for selfish gains in pecuniary form and feathering of their own nests thereby endangering the lives of site workers and those of future occupants of the buildings they supervised. This they do of their own greed and sometimes in collusion with desperate building owners who are prepared to do anything in the name of cutting costs. If theyre not inflating figures of quoted building materials which when bought would be clandestinely moved out of site, theyre either using substandard building materials where possible or aggressively altering the aggregate ratio of combinable elements in a way that surplus would be created for the purpose of corruptly enriching themselves. All these no doubt will sooner or later negatively impact somehow on the overall quality of the delivered job which could take the form of total or partial collapse of the edifice or strategic components of the building like roof, toilet, electrical fittings becoming seriously faulty no sooner than theyre put to use. Fixing these things normally come at extra cost to the property owners. Overtime, they've often gotten away with such criminal actions for which property owners and the nation have direly paid and are still paying. You can imagine a situation whereby site engineers would increase the ratio of sand and gravel to cement, usage of inappropriate and insufficient iron rod gauges and aluminum roofing sheets if they must be used at all. And where possible they completely ignore the use of some for maximum profits to themselves. Government can curtail the excesses of structural engineers and property owners by way enacting new laws if therere none yet that takes care of that or strengthening the existing ones to punish erring stakeholders. Once it can be established through forensic examinations of a collapsed building that the engineer(s) singlehandedly or acted in collaboration with the property owner(s) are responsible, they should be in for it. The era of allowing engineers to randomly gamble with peoples life must be brought to a final close with proactive measures that nip nefarious elements in the industry in the bud. Efforts should be made by government to also empower institutions and agencies operating in the sector through enhanced training and retraining of their personnel, improved salary and equipment so they can cover more ground unlike whats currently obtained. Situations whereby building projects would have gone far and in some cases nearing their completion before they realize that breaches have occurred only to begin to serve belated demolition notices are not healthy for the industry. Private or corporate people who signify their intentions to erect any structure must be taken through the necessary process and must be closely monitored to ensure rigid compliance with what the rules and regulations are as regards the type of building they intend to build during the different construction stages. Above all, like I said earlier, site engineers must be held liable in the events of collapsed buildings for theyre not supposed to act either independently or collude with anybody to lower standards set for their projects barring occurrence of natural evils like earthquake or tremors leading to the collapse of building theyre or had supervised.